Time for some big, big changes. Dr. Nolefan, being smarter than the average bear, hasn't taught an English class in years. And hell, as of right now, I'm not even in China any more. This makes NEITHER of us much of an authority on current affairs regarding teaching in China. Both of us are pretty busy with things out in The Big Room (i.e. the non-online world), and my health has been wobbly sometimes. Dr. Con went out for lunch some time ago and never came back...he is currently listed as Missing, Presumed Fed. So, we've obviously needed some more hands on deck. To that end, we've brought our old fiends ESCAPED LUNATIC and THE LOCAL DIALECT up to the status of Global Moderators, with the powers to lead and intervene as needed, pretty much anywhere except the Admins-only area and the Lounge of their opposite gender. We're not ones to forget old friends (REAL ones, anyway), especially AMONK and DRAGONSAVER, who have long and loyally toiled away in the Ladies' Lounge...so we're bringing them up to that level, too. These fine folks have a pretty good idea what their responsibilities are, I think, but I'll elaborate here so that everyone else knows, too. First of all, these folks are NOT Benevolent Despots (not yet, anyway). Ultimate decision-making, direction-setting, and responsibility still rests solely with myself, Dr. Nolefan, and (if he ever shows up for work...) Dr. Con. These guys also have no direct authority over anyone's membership status. Only the Despots can do that. - keeping an eye on what's going on, and taking corrective action (editing, deleting, locking threads, alerting the Despots, etc.) as they feel necessary. - Performing all those above duties with the lightest touch possible, only when it has to happen. We HATE editing and deleting and locking and so on, and try to only do it when we absolutely must. It's also hoped they'll work closely with the Despots in making these judgments, especially while they're new at it. - To alert the Despots to potentially good ideas, requests, and other input from all our members. No, we ain't a democracy here (well, sometimes, actually...but not always), but we highly value and respect what our members have to say...and make it happen when we can. - To take a leadership role on the discussion boards, especially those involving details of living and working in China...and to guide them to present the most accurate, timely, relevant, and useful information possible. - To be fair. To be fearless. To never hesitate to call a rose a rose and a turd a turd...and to be savvy enough to know the difference. To help preserve the identity and values of the Saloon, and to keep the Saloon true to itself. This is not a small job, my friends. Much trust is being placed on these people's heads. Please give these folks your congratulations, your support, and your love. Oh...I should also mention that The Hypnotoad will also be having much more influence here. OK ladies, you heard the man. Line up and give me your love! Line up and give me your love! 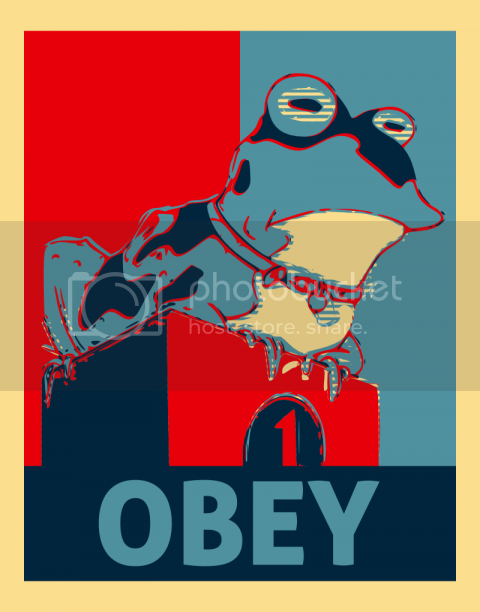 Save it for The Hypnotoad.